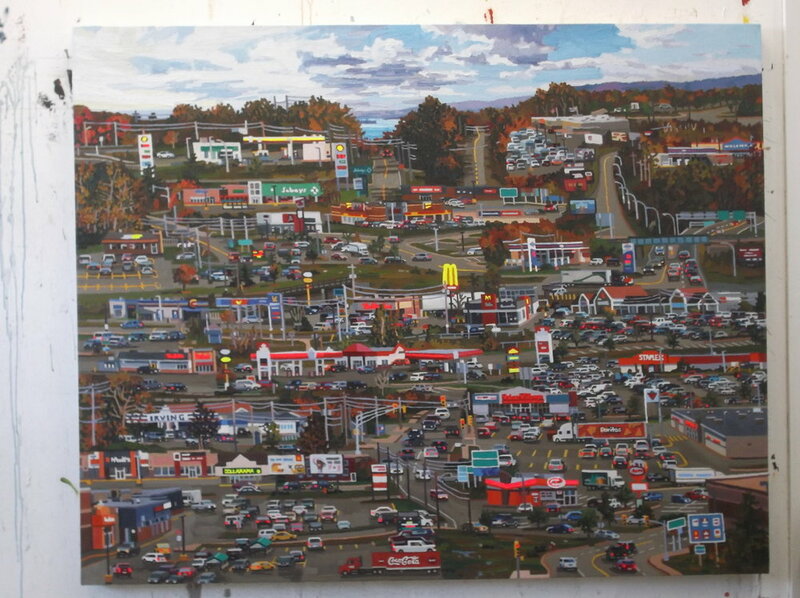 Jack Bishop paints brandscapes— artificial business park landscapes teeming with nameless highways and late capitalist branding that coalesce into a Geography of Nowhere. Like many suburban teens, Bishop "did a lot of driving around just 'cause there was nothing else to do," he says. 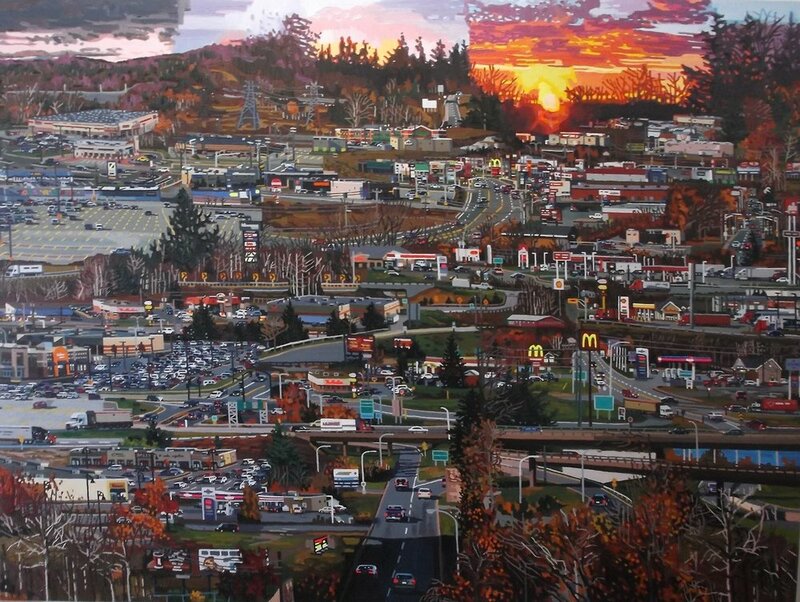 Our eyes wander through his paintings like someone meandering aimlessly through the sprawl. We become lost in a maze of familiarity. 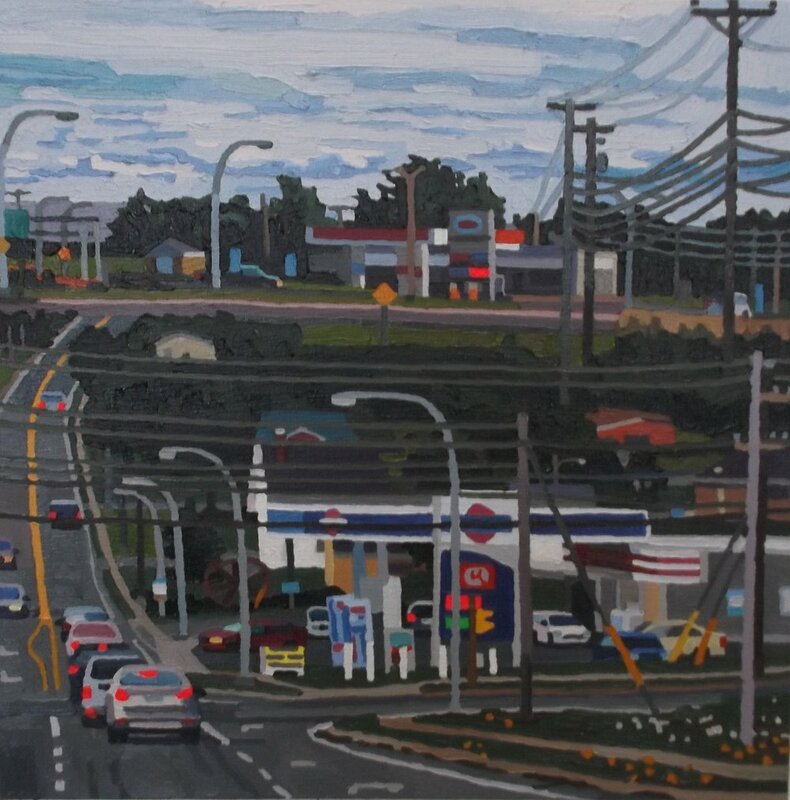 The strange perspective and thick paint handling call to mind Wayne Thiebaud's streetscapes while still feeling fresh and from this century. In ">>>>>>>>>" (2017) we see a tight cluster of strip malls and shopping centers receding towards dueling sunsets. The painting has obviously been collaged from multiple images but it remains unclear where the edges end or begin. 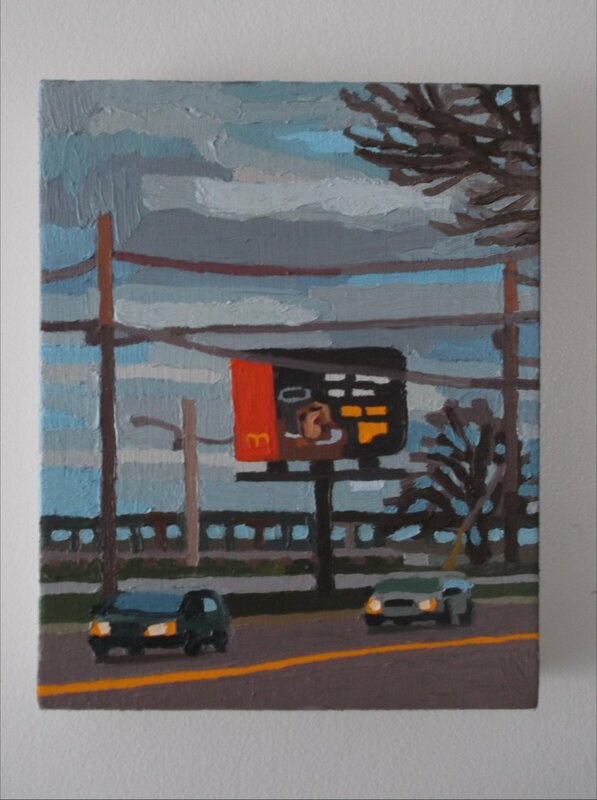 McDonald's golden arches, that iconic signpost of North American highways, appears here no less than three times. 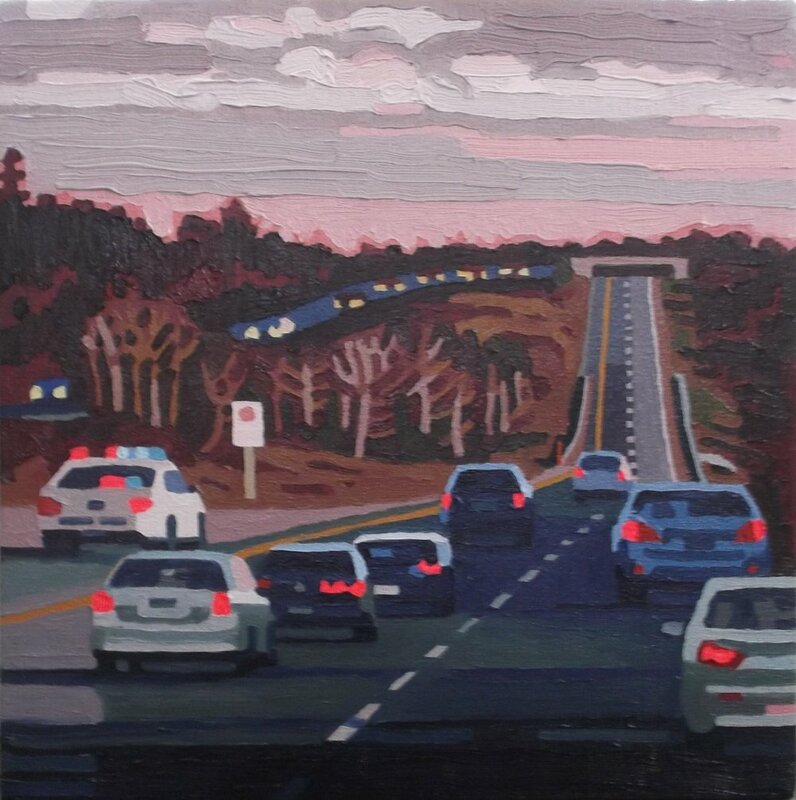 Bishop's 2016 painting, Speed Trap shows a group of cars on a highway passing a police car on the shoulder at dusk. The colors are muted- everything keyed to the luminous red of the brake lights, all of which shine brightly. The paint handling is simple and deft— leaving many details to be imagined, like a memory or a dream. Tim Horton’s with Green Rain (2011) is notable for the way the green of the rain acts as both surface and image. It's an interference pattern like looking through mesh or fencing. But somehow, despite the green-ness of the paint or the thickness of the strokes, it still feels like rain.